Kinvara, Co. Galway lies on the west coast of Ireland and is one of the area's prettiest villages. There's a quiet pace of life there, even though the hurly-burly of Galway City in summer is only half an hour away by car. 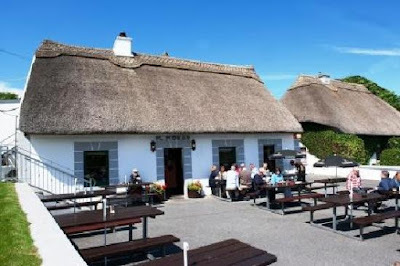 A traditional fishing village, Kinvara is on the sea, and forms part of the famous Wild Atlantic Way, the coastline that snakes its way down the western seaboard from north to south. Perhaps the most prominent feature of Kinvara is the 16th-century castle of Dunguaire which stands alone on a little promontory, like a sentinel on the approach to the village. Come and sketch the colour and tradition of Kinvara with Róisín Curé this September: there'll be three and a half days of intense sketching instruction, punctuated by evenings of music and dining in some of Galway's best pubs and restaurants. Accommodation for those who wish to avail of it is in the Kinvara Guesthouse, situated in the heart of the village, on a bed and breakfast basis. Every night we will dine somewhere different; all the restaurants are well-known in the area and offer the best in our fabulous local cuisine, with local seafood and seasonal produce on the menu. If there are any oyster lovers amongst you, the fact that native Irish oysters will have just come back into season will be the cause of excitement. The focus will be on using ink and watercolour on the move. The materials we will use will be brush pen and fountain pen with waterproof ink in black and grey and watercolour. Every day we'll have a chance to look at the work from the previous day and get everyone's personal approach and how they felt about it. Meet and greet in the Pier Head, a charming pub on the water's edge on Kinvara Quay. After we've all been introduced, we'll have dinner looking out over Galway Bay. You can see it at the back of the quay here - it's the yellow building facing the quay. A bright an early start will see us doing a few warm-up sketches before tackling the exterior of Dunguaire Castle from a handy vantage point. We'll stick to a very limited palette: in this way not only do we keep things simple, but we can concentrate of form and value without the additional element of colour. Lunch will be arranged on the day but Kinvara has lots of options. The afternoon session will centre around sketching the main street of the village, which is lined with charming, brightly coloured shops and pubs on either side. We'll take a much looser approach, with strong colour being the focus of the afternoon session, working on the principle of building many layers of watercolour in order to achieve a strong result. The evening will take us to Moran's on the Weir, a charming restaurant on the banks of the Dunkellin River. This river meets the esturay near here and teems with salmon and sea trout, which can be seen leaping on the tide. If the weather is fine we'll take a pre-dinner stroll along the green path to the seashore. 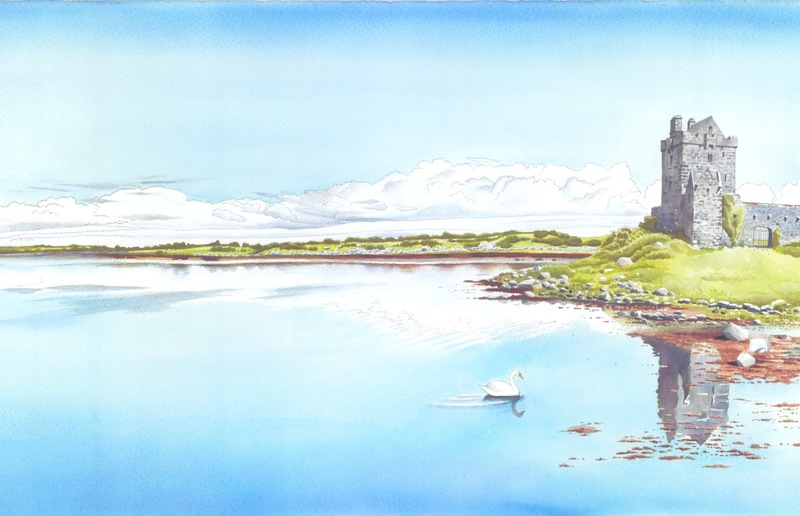 This is a very picturesque spot and will be recognisable from Róisín's many sketches from the area. After dinner in Moran's we'll return by minibus transfer to Kinvara. See if you can spot Moran's on the far side of the water...it's pretty small! We'll steal a march on the crowds and arrive in Kinvara Farmer's Market to watch the stallholders set up at 9.30am, for a 10.00am start. This market takes places every Friday on the Square in Kinvara, right on the doorstep of the Kinvara Guesthouse and is a very convivial, lively spot every week. We'll focus on sketching people: we'll learn the tricks the urban sketcher uses when drawing moving forms such as making composites of many people, repeating certain figures and choosing those making repetitive actions. There'll be musicians and colourful characters manning stalls from Ireland and abroad. Lunch will be fresh food from the stalls in the market. The afternoon will be dedicated to Dunguaire Castle: all the participants will have a pass for the castle which will be valid for the whole day. There will be an opportunity to sketch inside the castle, and indeed on the parapets if the sketcher wishes. This will consist of two parts: a demonstration sketch of the dining room will be followed by each participant choosing their own spot, and Róisín will go to each student and offer one-on-one attention during this session. The evening will be a time for relaxing: a special banquet will be offered in Dunguaire Castle, which aims to replicate in part a traditional medieval meal (i.e. you will be offered mead!) This is followed by an evening of entertainment provided by the actors and singers of the castle, who will treat us to stories and music of old Ireland. We'll finish at the Castle at about 8.45 and there'll be time to stroll back into the village and get in a session of traditional Irish music in one of Kinvara's warm and friendly pubs. You'll be very welcome to sketch and Róisín will make suggestions in advance on some good ways to approach a sketch of musicians. Saturday in Galway is the liveliest day of the week in Galway City. We'll head into town in the morning and make ourselves comfortable on the banks of the Claddagh, looking across to the colourful traditional buildings of the Long Walk. There are usually boats and swans in the foreground as well as the odd squabbling seagull, which will offer us the perfect opportunity to use foreground and background subject matter in order to give depth to a sketch. The row of houses of the Long Walk will offer us the challenge of combining line with colour in order to capture the feeling of a complex scene. There is a very busy and lively outdoor market in the heart of Galway City and it is highly recommended for a visit, although it would be too crowded to sketch to all but the most patient! However there are some really excellent food stalls in the market and you won't do better for an al fresco lunch than one of these. After lunch there will be a sketching session on the city side of the River Corrib, where there will be more challenges of capturing city life in watercolour. However there will also be time to stroll around the tiny city on your won if you wish. This is a view of the so-called "Latin Quarter" of Galway, with the River Corrib behind the viewer. The street to the left is the main street winding its way up through the city. After a busy day of sketching we will reward ourselves with a special treat: dinner in Ard Bia, next to the Spanish Arch on the banks of the River Corrib: those with a window seat will see the river rushing past on its way to the Atlantic. We'll return to Kinvara after dinner, and those who still have the energy can partake of some more local music! 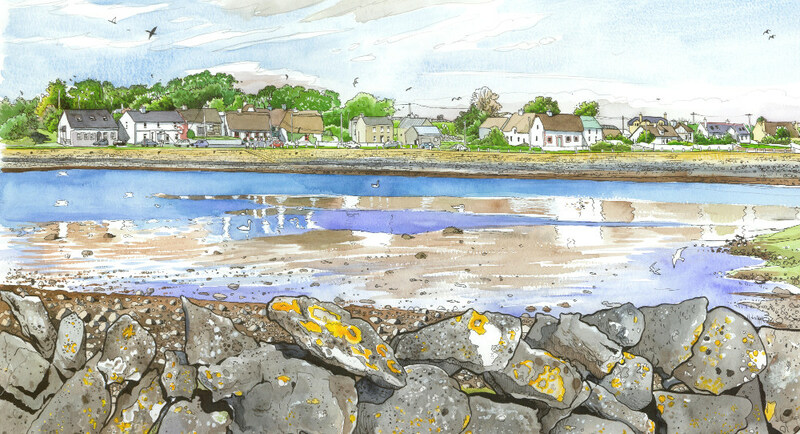 Our last morning will be a chance to enjoy sketching in Kinvara once more. We will head down to the quay and take on some linework in the form of traditional boats. We'll look at underdrawing in pencil followed by a rapid and almost continuous line as a way to tackle very complex structures. After the session we'll have a look at the results from the workshop and hear everyone's contribution. Lunch will be from one of the venues in Kinvara and there ends the workshop, as we say farewell until the next time. The Kinvara area is full of activities for the non-sketching travelling companions. There is, first and foremost, the beautiful Burren, a wonderful wild landscape to walk and lose yourself in complete tranquility, on the famous karstic pavement which dates to the Carboniferous period, when Ireland was covered in a shallow, tropical sea. Today it is full of micro-climates and the botany lover will be enchanted by the flora to be found on the Burren. Maps will be provided for those who wish to explore the region. Other than that activities include a visit to the Burren Perfumery, Ailwee Caves and the bird sanctuary which is part of that attraction. There is also the Burren Smokehouse in Lisdoonvarna a few miles down the road. If your partner wishes to travel a little further they can go into Galway City, an event in itself. For the more adventurous there is golf, surfing, hill-walking and of course a visit to the nearby islands is an unforgettable experience if the sun is shining. The cost for the workshop, including accommodation in the Kinvara Guesthouse, breakfast in the hotel, transfer to and from Moran's and Galway City, entry to the Castle and evening meals (set menu) in the restaurants we have arranged is €1035. The cost for the workshop without accommodation or breakfast, but including transfer to and from Moran's and Galway City, entry to the Castle and evening meals (set menu) in the restuarants we have arranged is €762. The cost for non-sketching companions including accommodation in the Kinvara Guesthouse, breakfast in the hotel, transfer to and from Moran's and Galway City and evening meals (set menu) in the restaurants we have arranged is €660. The cost for a non-sketching companion without accommodation or breakfast, but including transfer to and from Moran's and Galway City and evening meals (set menu) in the restaurants we have arranged is €335. There will be a discount of €100 on the above prices on all bookings paid in full before 15th June. Please see Róisín's website at roisincure.com (http://roisincure.com/wp/workshop-sketching-the-wild-atlantic-way-kinvara/) for all details of what is required in the way of sketching equipment, and what is and is not included in the price. Róisín speaks English, French and Spanish and will be very happy to help you with any questions you might have in any one of these languages. As the numbers will be small - the maximum number of participants will be just 13 - you will be assured of lots of personal attention.